Looook into my eyes. Reeeeelaaaaaax. Taaaaaake meeeeee hooooome. 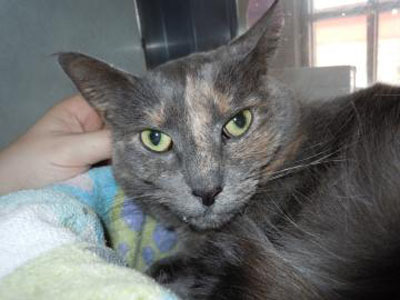 Violet is a 5-year-old female cat with a beautiful grey and buff face, green eyes and a soft fur coat. She was brought in to Lollypop Farm because her owner felt she was too much responsibility. After having a home of her own for five years, Violet is not accustomed to life at the shelter. She tries to pretend she’s not here and hunkers down in her basket. But, when given the time, Violet enjoys attention and loves to be petted. This sweet girl is declawed, so she is looking for a home where she can remain indoors. She gets along well with other cats and is currently living in the cattery. Come out and meet this quite, gentle girl. Make sure to give her a little extra time to get comfortable with you and you'll quickly see she is a wonderful cat! Astro, the dog from last week is still waiting to be adopted.